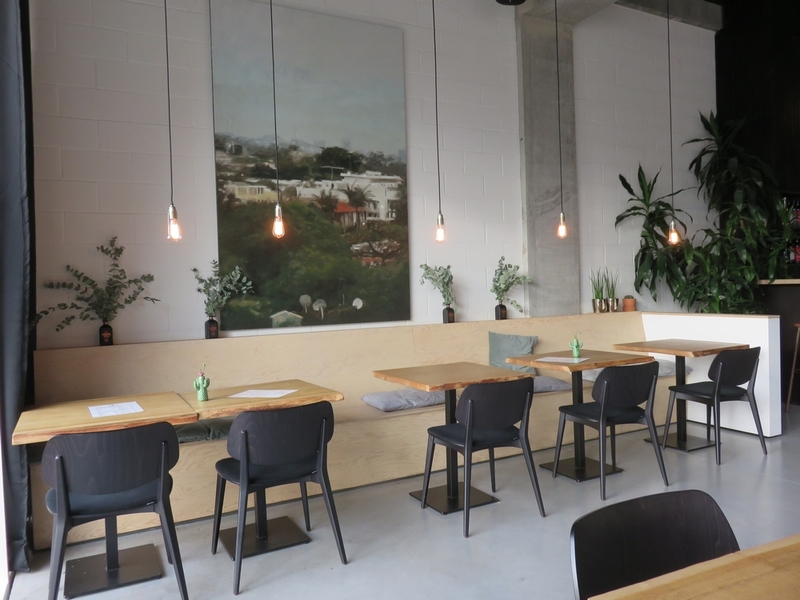 Restaurant review #107 – Noordoever is a new place at the edge of Louvain, on the north side (opened in 2015). 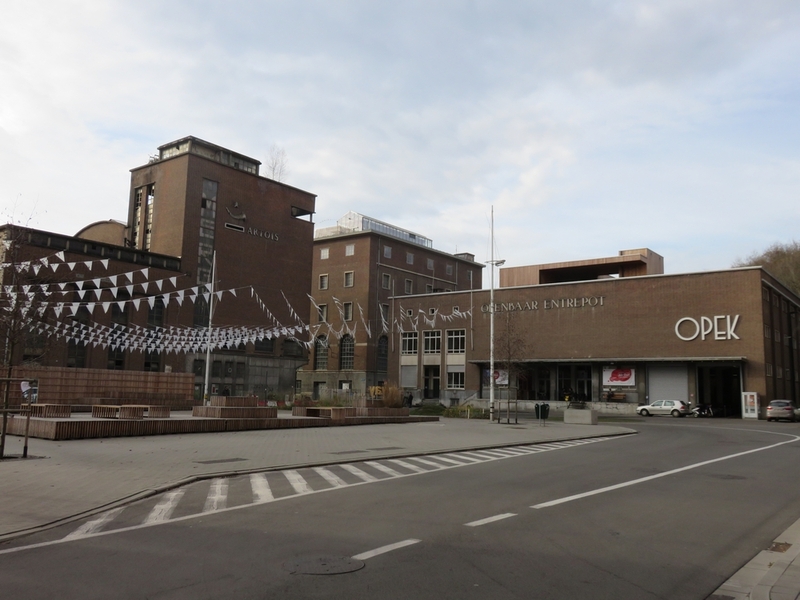 It is close to the docks and the old factories of beer brewing company Stella Artois. The area around Noordoever is nicely renovated, with new appartments and a nice open space for events and get togethers next to the docks. Restaurant Noordoever is a nice spacious place, with large windows and as such very bright. It’s a lovely decor. Some chairs have cushions, which is nice and comfortable. There is also a seperate room for meetings or group lunch. 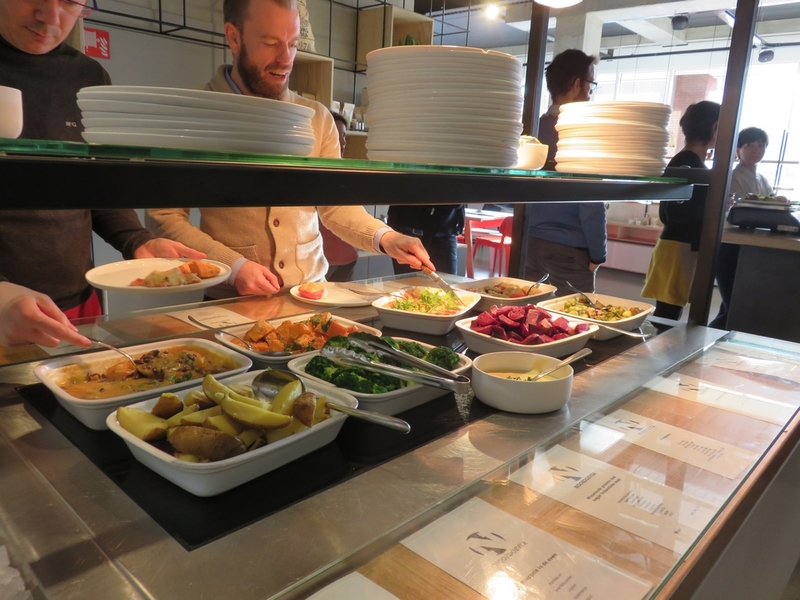 You cannot order a la carte, but there is a buffet with loads of options to choose from. 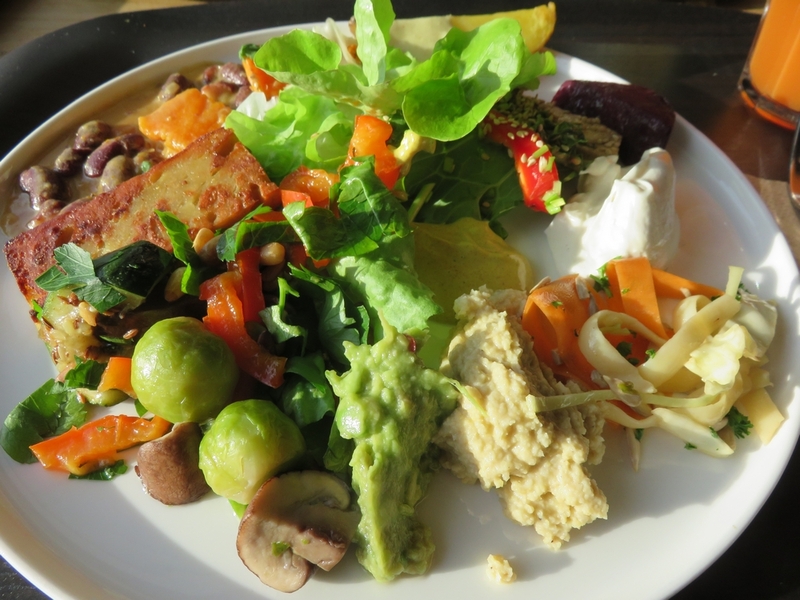 Noordoever is a vegetarian restaurant, but most dishes at the buffet were vegan, which was clearly indicated next to the dishes (also with the ingredients of the dish). The buffet normally starts at 12 o clock, but it was was more like 12.15 when the buffet was ready and all dishes were presented and we could start lunch. For drinks we had a fresh juice (4,50€) and a homemade limonade (3,50€). The buffet is not all you can eat, but pay per weight. 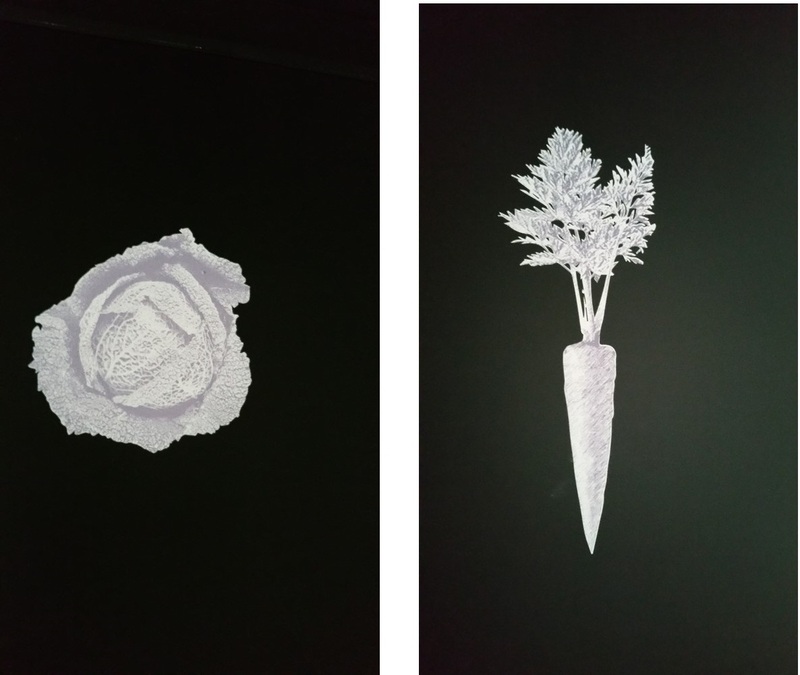 We paid 30,44€ for the two plates. For dessert there were cakes, brownies and vegan icecream (from heppie cow). The coffee came with a nice chocolate (yes it is vegan!) and was 2,80€. 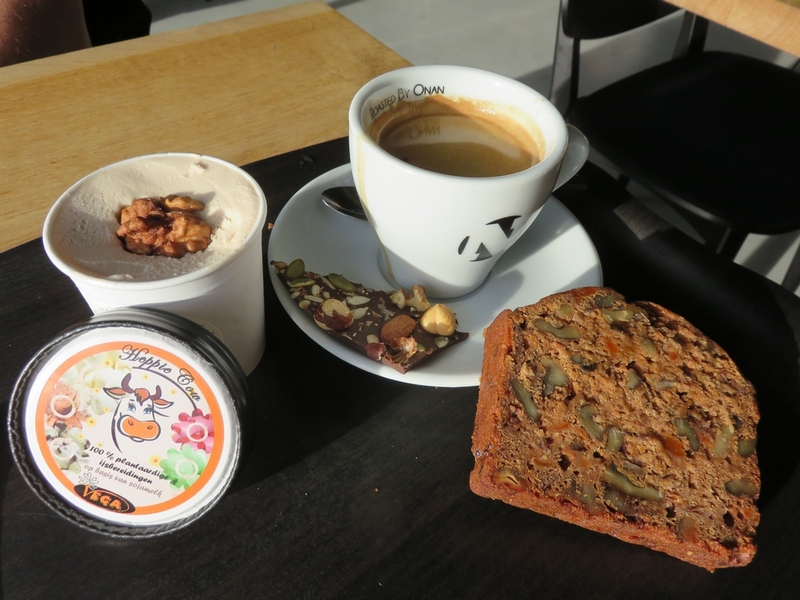 we had an icecream from heppie cow (4€) and a piece of carrot chocolate cake (4,50€) but that was very heavy (and expensive). Our lunch in total was 54,24€. Not so cheap, also considering it is self-service (you pick a plate, choose from the buffet, order you drink at the counter and pay at the counter. and afterwards put your plate away). 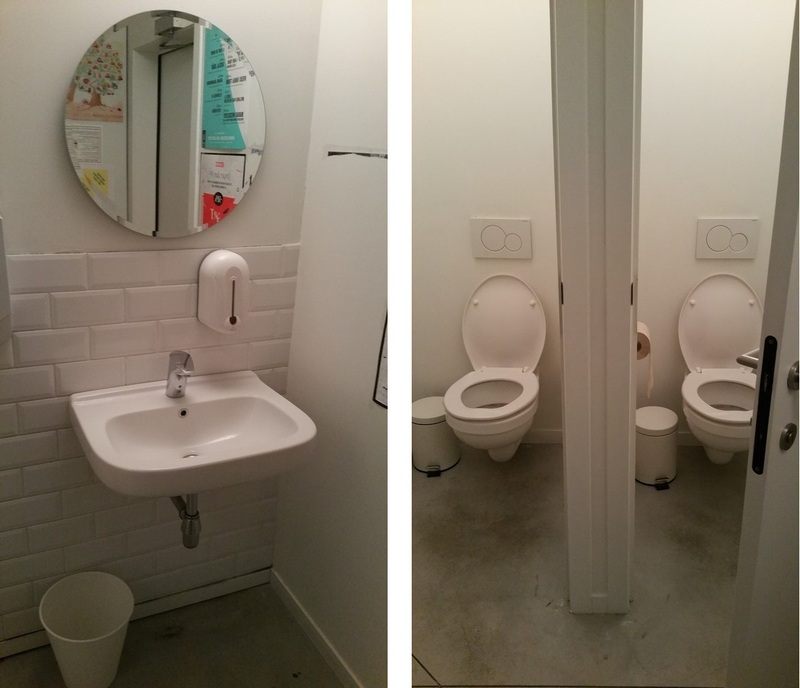 Toilets were clean and tidy, and there was a good functioning hand blowing dryer. Loved the gender indications on the door wall. 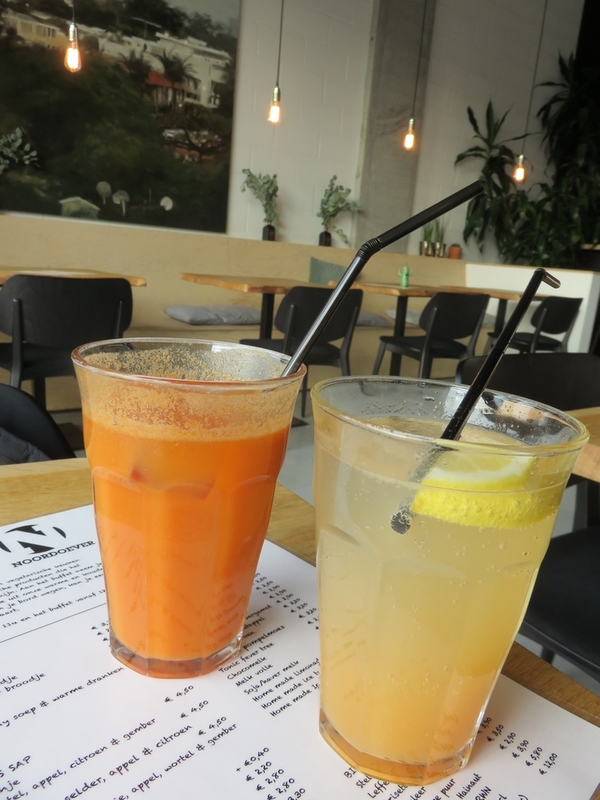 Noordoever is a very nice addition to Louvain and we defintely want to visit again! I wish we would get such a place in Bruges! Looks and sounds very good. We used to go to a veg restaurant in Fuengirola that did a very good all you can eat buffet. 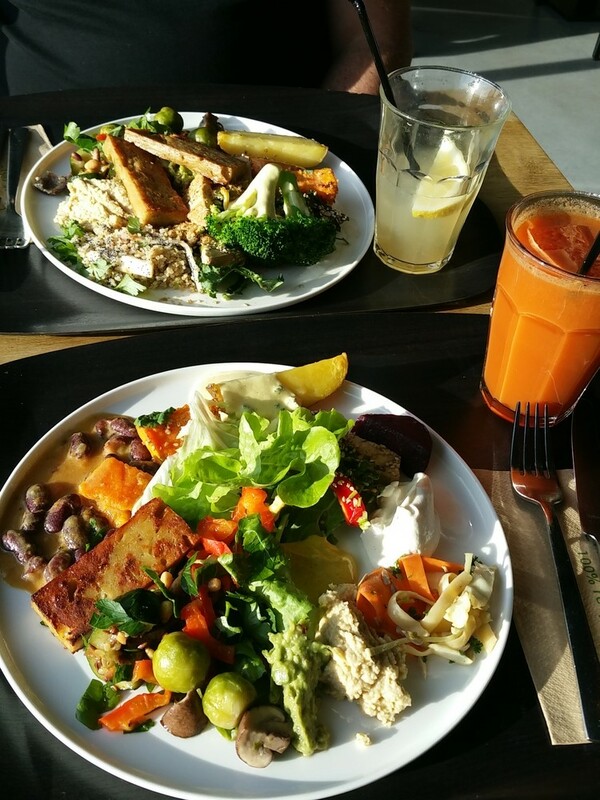 Two main courses and loads of salads and breads. 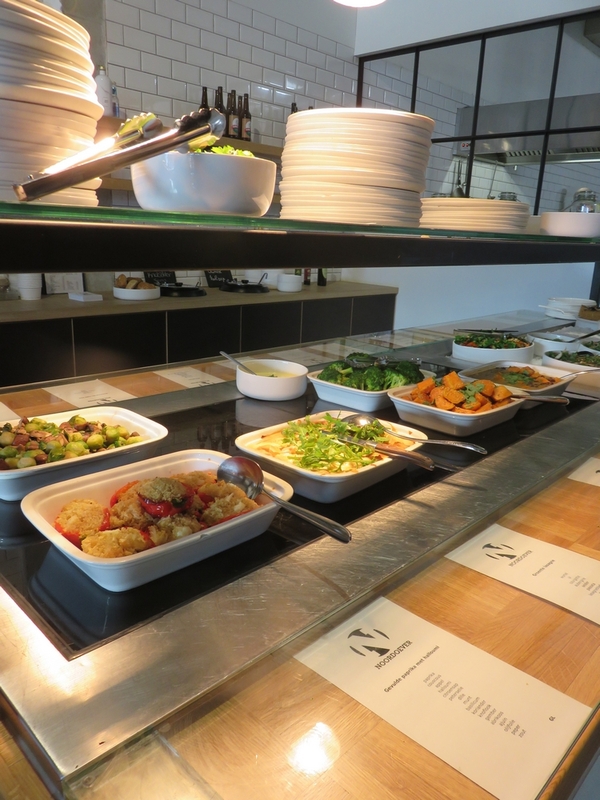 Like N, there was no a la carte at lunchtime, just the buffet. The restaurant was usually packed. Sounds good! 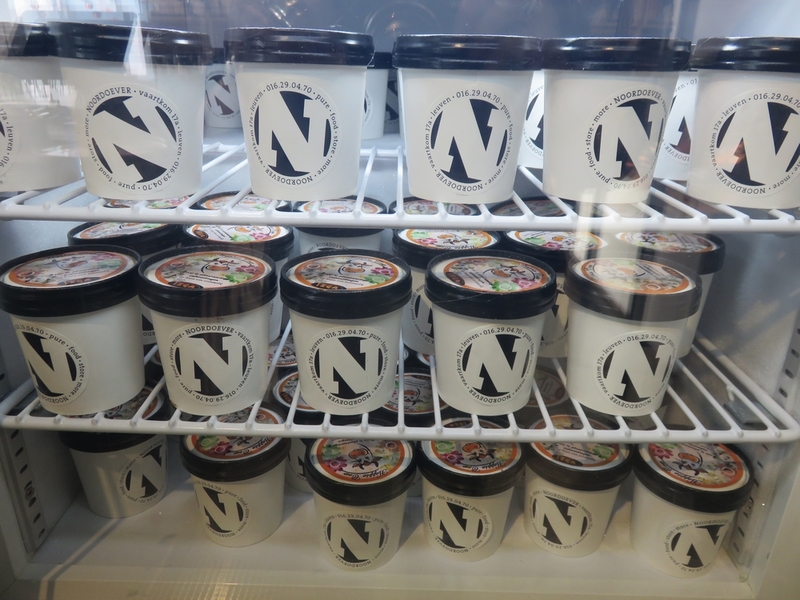 What was a pity at Noordoever is that it wasn’t all you can eat, which did make it quite expensive. thanks for your comment, I wanted to check out your blog, but don’t find the link in your gravatar. Do you have a blog? 2,95€/100grams is quite expensive if you compare it with the price of Lekker Gec (same concept of pay per weight, at 2€ + 1,69€/100 grams). Maybe worth a visit if we’re in the area, but I’m not sure I’d drive to Leuven just to taste it at that price. Indeed more expensive. 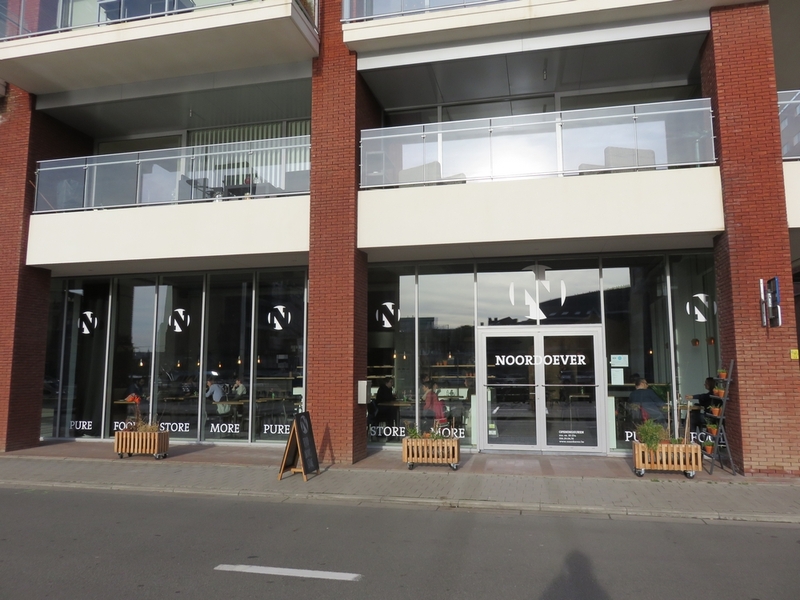 On the other hand, I found the variety of the buffet (and the desserts), the venue (interior, space, bright, modern) and accessibility much better at Noordoever, than at Lekker Gec.